Or (if sartalas would agree) little bit more gravel/dust or other surface next to the kerb, which has a higher slowdown value than the kerb - in case AIs would be flying over concrete walls, if sunk tyre applied there. It should be sufficient to detter people from using regularly an extensively wide exit line from the chicane. Thanks for the advice. Tracks were already finished when I read this. I decided for the sunk tyres and ran some tests and made some changes to the AI line all over the track, so it should be a lot better than before. But we used your idea back in Silverstone for example, where we didn't want anybody to exploit the tarmac run-offs. I'm not so keen using it in quick bends because a line of gravel, mud or even sand doesn't do much to slow our cars down, especially when you are also driving on the kerb (but outside the white lines). But I'm going to look into a better compromise between a surface that slows you down sufficiently at high speeds and a sand or gravel traps that still let's you go on. Where is training track for race? We also had some sort of bug with the pit lane version of the track. For some reason an AI car, and not my own car, started in the pit lane every single time I tried to start a new race. Starting order was set to "points" and i selected my own profile first. 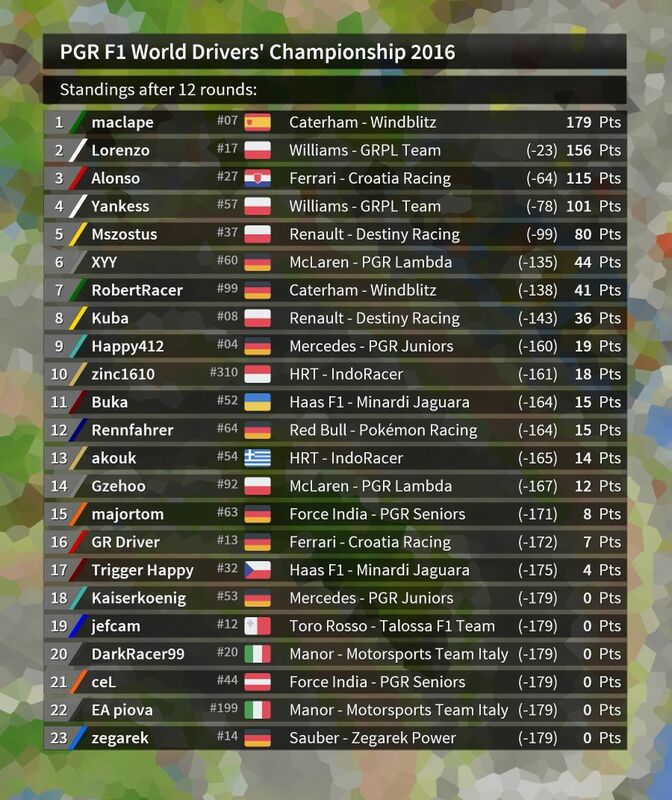 I did not mix up the starting grid slots either. And Majortom was not able to reproduce that mistake. Anyone a clue what could have happened? To make sure that none of the AIs will ever jump behind the concrete walls in the chicane. 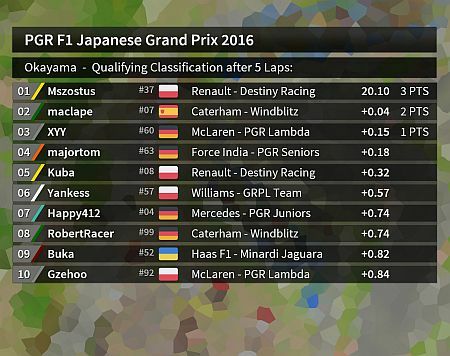 Two Top Driver missing - Early decision in this season? Login for Qualifying Okayama is ready. Download the tracks here! Warning: AI-line changes due for the race. Only 12 points over Lorenzo and Maclape would defend his 2015 Drivers' Championship title. Supposing Lorenzo fails to participate, a second place on the podium would do. And Maclape has only once finished worse then second (3rd, USA 2016) in his career. However, if Lorenzo does start, the Championship would probably be decided in Brazil. Just like Maclape, Lorenzo never missed the top 3 in his career, unless he crashed or was somehow penalized. Even in the worst case of a Maclape win, a 7th place finish would keep it all open for him. 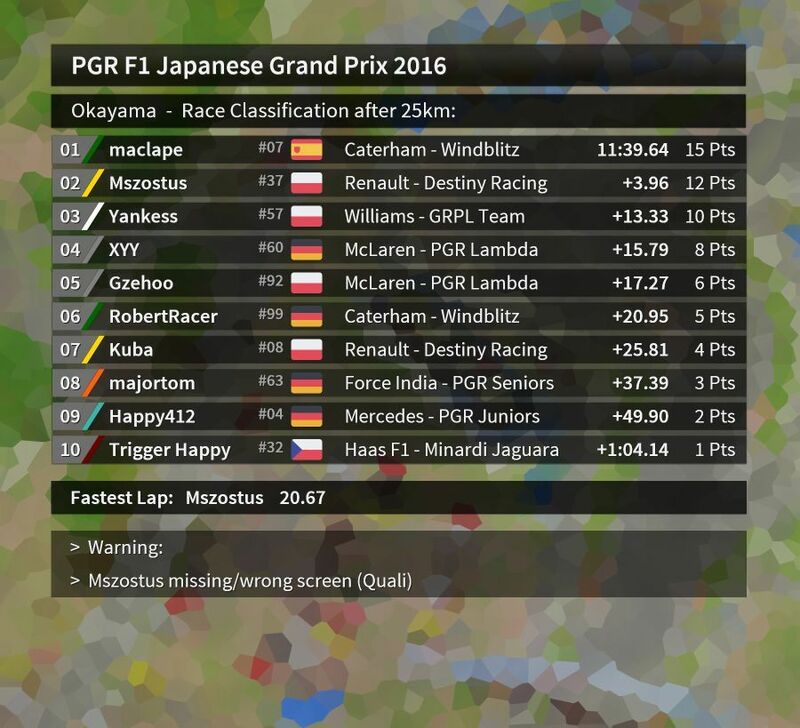 In this unlikely case, 2 perfect Grands Prix might eventually lead to a tie in the standings if (!) Maclape does not score at all. The Championship would then go to Lorenzo because he wins the tiebreaker of most Grands Prix victories, which would then be 9 - 6 in his favor. I won't be able to participate this week, as some of you know already that I'm away for the weekend, but I'll be surely back for two last GPs. OK, good to know. Enjoy your weekend. AIs took all the fun from the race. What happened? The original AI used to be quite messy so we changed the AI line. They were breaking very late in Attwood Curve, Hair Pin and Redman. Overtaking there forced me to change racing line significantly. These are some of places where the AI used to go off the track on worn tyres. They even ploughed straight into me when I was driving right in front of them and taking a wide entry line. 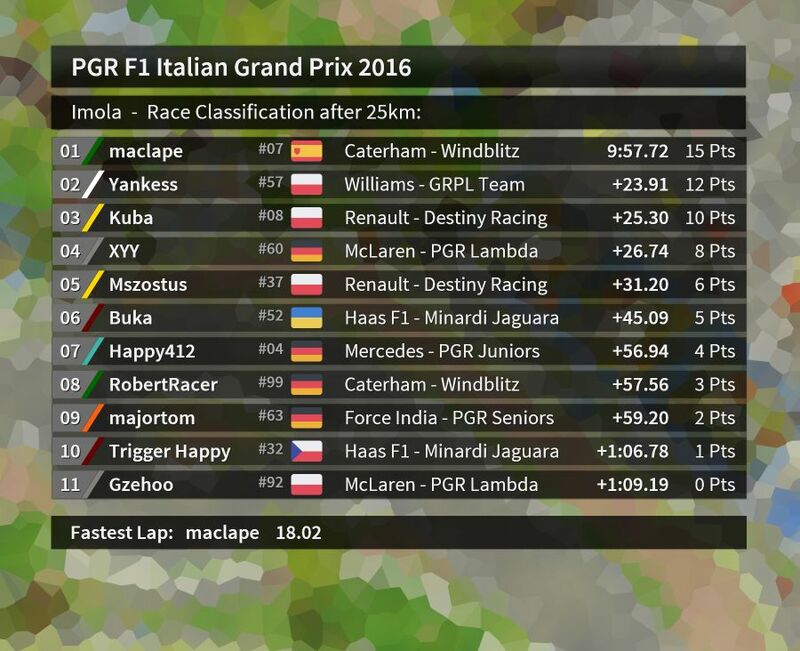 After all the changes to the AI line, I rather thought they are now too competitive through the whole middle sector between hairpin and Hobbs. Points for all! 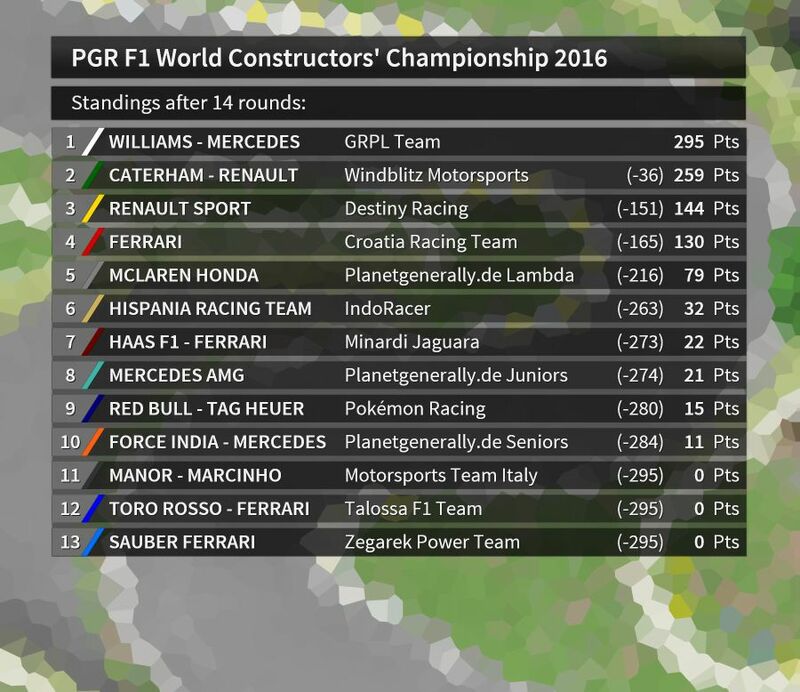 Early decision in Driver's Championship? 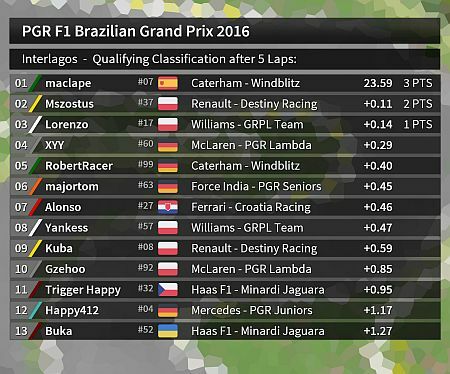 Login for Qualifying Interlagos is ready. 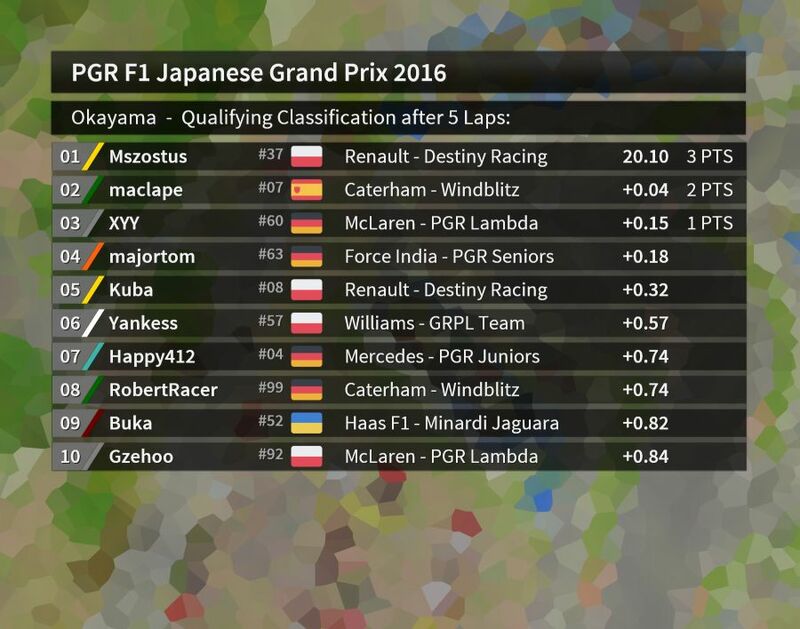 Maclape defends his 2015 drivers' title against Lorenzo who is going to be second in the standings. Mixed conditions are still more like dry rather than wet, apart from the first laps IMO. Alonso and Lorenzo back in Brazil. Hopefully also in the Race? All Driver without Quali must start from Pitlane. Mixed weather in Sao Paulo. I guess it was somewhere on the first few pages of this thread where I promised Mszostus that the mixed palette would be used more often this season. "Mixed" is actually the wrong word because it implies that the weather changes frequently throughout the session, which is impossible to do. So we imagine it being more of a half-wet track that dries significantly, so that you end up with a car whose values are balanced between dry and wet with a slight favor to the former. 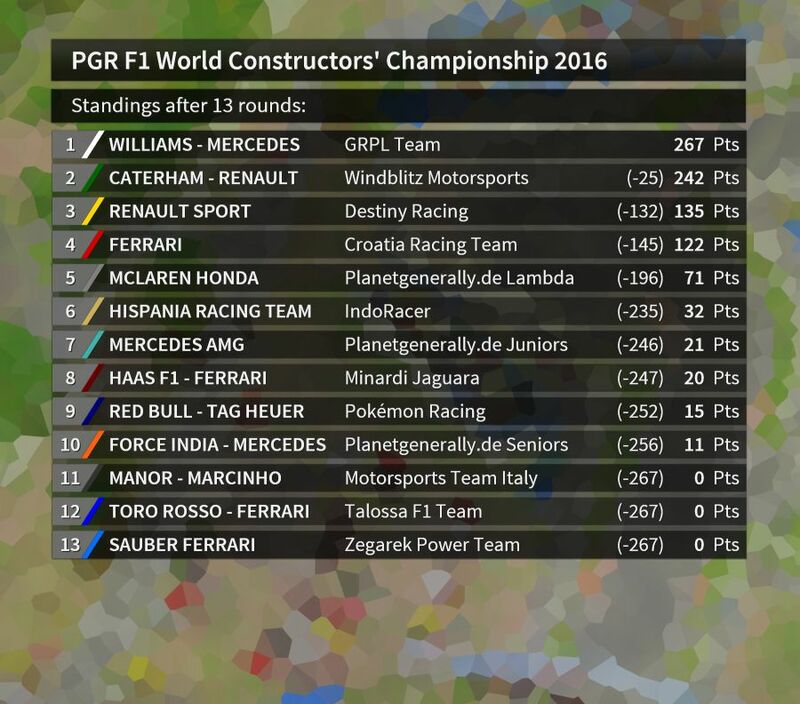 Decision in the Teams' Championship? 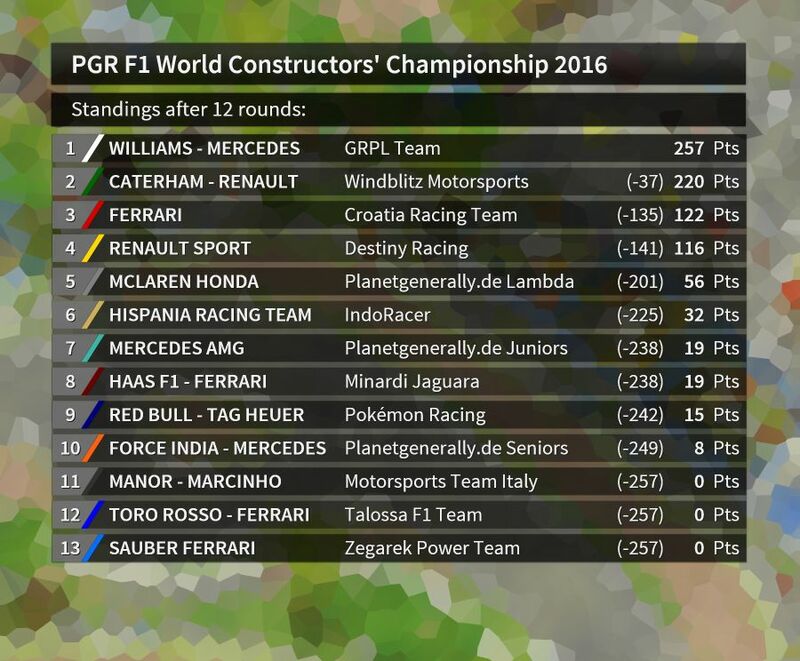 Is the team title going to Williams - GRPL today? 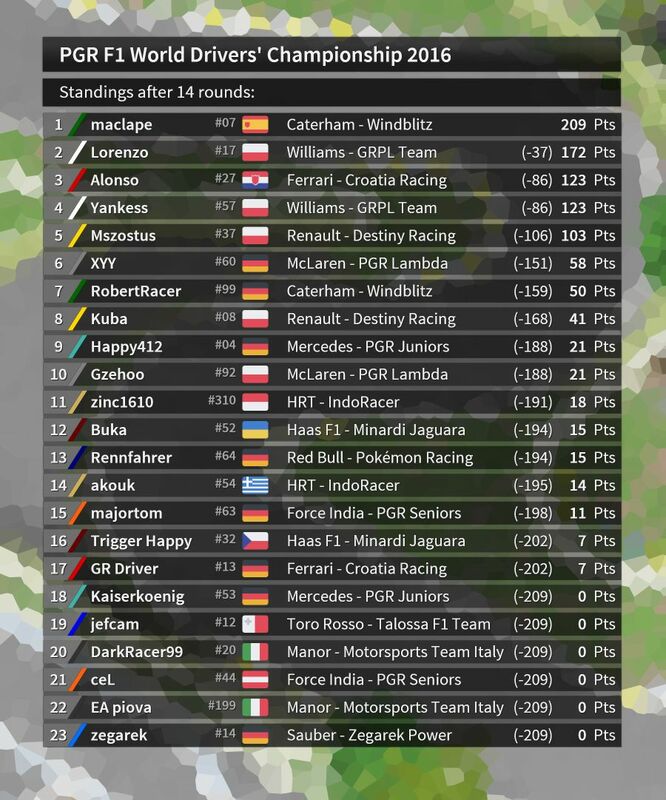 Lorenzo and Yankess are currently leading last year's champions Caterham - Windblitz by 23 points. 33 points or 32 points and another victory by Lorenzo or Yankess in Brazil would seal the deal before the ultimate round in South Africa. 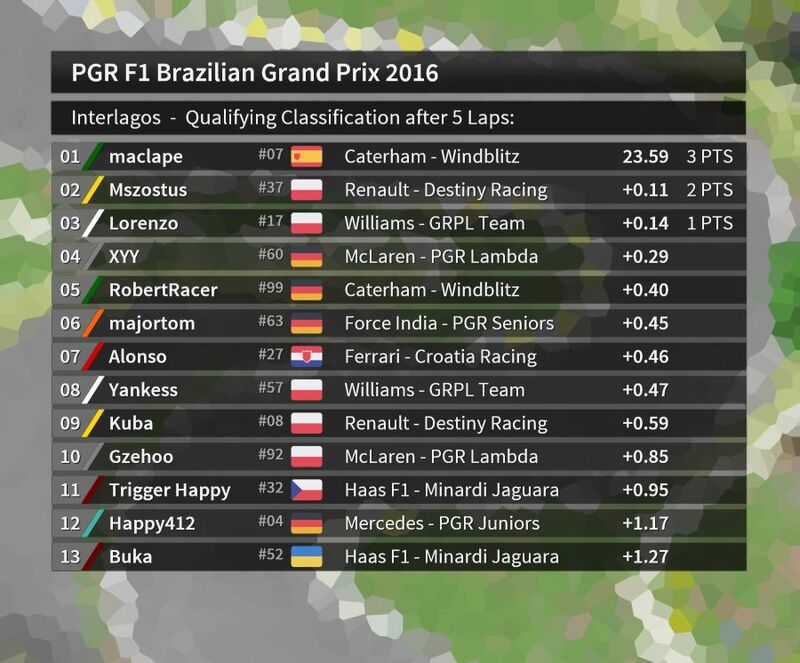 On the other hand, if pole-sitter Maclape defends his pole position and wins the Brazilian Grand Prix, the Championship would go down to the wire - no matter what happens behind him. 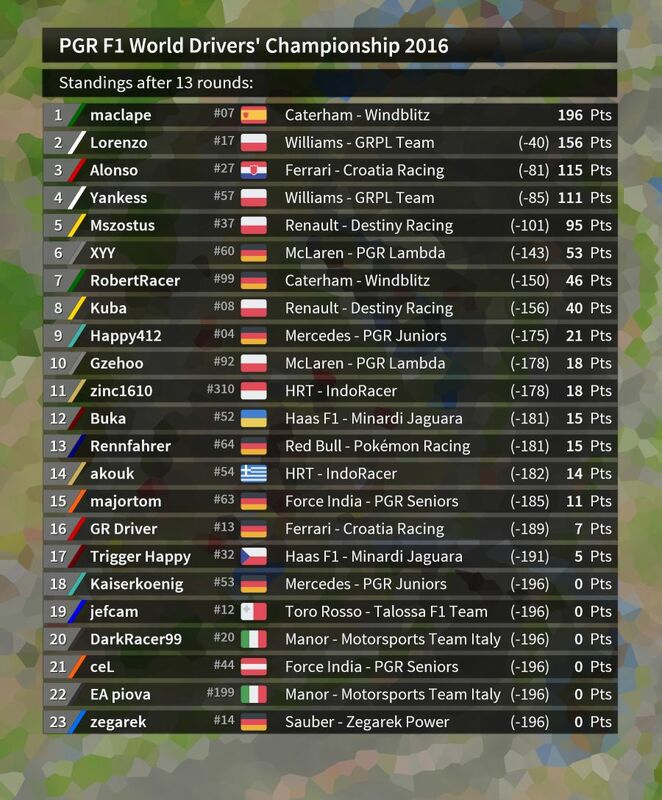 2015 winner RobertRacer is also in a good position for the race win, or at least to gain some points on their opponents. However, the Championship is technically out of Caterham's hand, as not even a double in Brazil and South Africa and a front-row lockout in South Africa would help as long as Lorenzo and Yankess finish in 3rd and 4th on all these occasions. 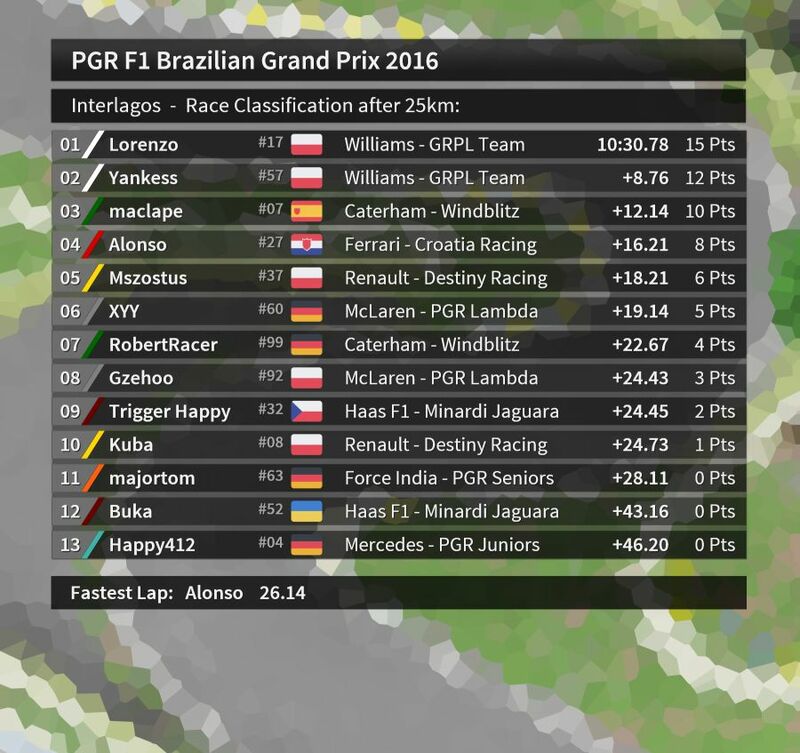 Bad weather in Sao Paulo - also a problem for the Top-Driver? 2 Drivers crashed and needed an extra Pitstop! Login for Qualifying South Africa is ready.